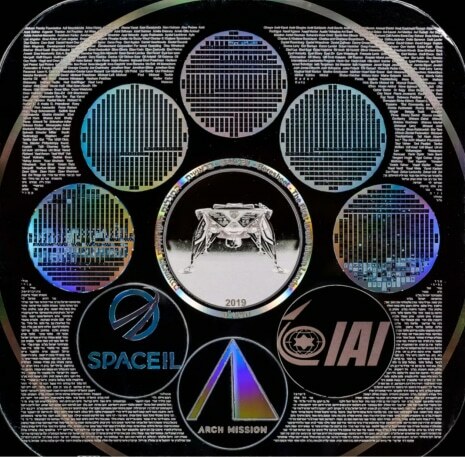 When SpaceIL’s Beresheet lander crashed on the lunar surface moments before it landed on the moon, it not only dashed Israel’s hopes of sticking its lunar landing, but took the lander’s payload with it. One item may have survived, though: The Lunar Library, that 30-million-page backup of humanity’s greatest cultural offerings (and one queso recipe). Turns out that the Lunar Library’s collection of creations, including the complete Wikipedia, the Rosetta Project, books selected by Project Gutenberg, as well as genome maps, 60,000 analog images of pages of books, photographs, illustrations, and documents, and much of the world’s greatest art, music, literature, and scientific knowledge, may have survived the crash. The Arch Mission also announced that the Library was carrying some previously undisclosed information. There was a collection of music from around the world that was intended to be curated and crowdsourced with planned future lunar missions, essays from the Genius 100, an “active and engaged community of 100 exceptionally imaginative and impactful human beings, including authors, scientists, entrepreneurs, and prominent political figures,” and a key to 5,000 languages with 1.5 billion cross-language translations. Most intriguing, however, was the inclusion of the top-secret technological innovations of illusionist David Copperfield. The famed magician had been collaborating with the Arch Mission Foundation for a future project, which is either up in smoke or still TBD. Perhaps the crash will motivate him to finally pull off that trick he’s been rumored to be working on for years: Making the moon disappear.